It’s time for a new instalment of cultural station, don’t you think? 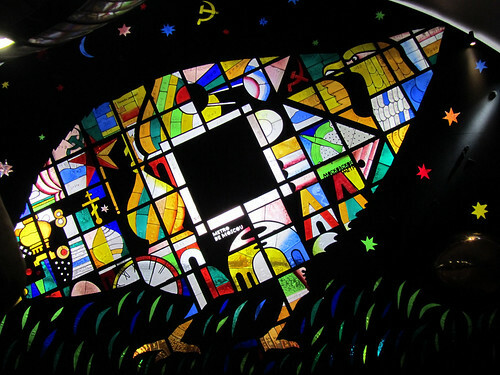 I happened to be on my way to Madeleine today so instead of taking a bus like I normally would, I took the metro instead so I can photograph this panel of stained glass of Ryaba la poule (Ryaba the hen) by Ivan Loubennikov. Unfortunately, in my hurry (I needed to make it for my tango lesson across town), I didn’t notice that poor Ryaba is now headless, oops. Un jour elle pondit un œuf extraordinaire : tout en or ! Le vieil homme tenta de le casser : toc toc ! : rien à faire ! Sa femme tenta de le casser : toc toc ! : rien à faire ! One day it lays an extraordinary egg: it’s all in gold! The old man tried to break it: toc toc! : nothing happened! His wife tried to break it: toc toc! : nothing happened! Ps: spot the egg which is reportedly 80kg in weight! where’s the egg lil? middle right? this egg is not in gold but in brass – imagine a real 80kg gold egg? it would have been robbed a long time ago!